A happy family cooks and eats together. Designing your kitchen to work for kids and adults is remarkably easy to do without involving extra expense. All ages benefit from the fun of cooking, although through the eyes of a child, kitchens are magical places. Steam rises from pots on the stove, tantalizing smells waft through the air and strange, inedible substances turn into mouth-watering foods. Utilize this enthusiasm, include the kids; beyond teaching valuable life skills and having quality family time, cooking together is just plain fun. Here are a few of the design considerations to guarantee time spent together in the kitchen will make unforgettable family memories. Obviously the best way to design a child-friendly kitchen is to do it from the very beginning. The place for the younger cook must be carefully integrated into the work and traffic patterns of the overall space. Given a child’s height, sight lines should be considered, both in the space itself and any windows or doors to outside. Whether you’re designing or renovating, plan for sufficient space to allow traffic to flow easily through the kitchen without obstructing the work triangle. Aisles should be 36″ across at a minimum, but 48″ is optimal for better flow. Good additions in the "kid zone" are an under-counter refrigerator and their own sink where possible. When a sink is included, faucet features such as anti-scald, clear cuing and motion sensor controls can minimize safety concerns. . If this zone is to include a microwave, it must be at a safely-accessible height for kids. If the microwave is built-in, then 24" off the floor or the low end of the suggested range would be best. But by putting a freestanding microwave on a shelf or counter, you can easily adjust the height to suit growing kids. The position of lighting may need to be adjusted in a kids prep zone. Place light-switches at child-friendly heights; a fixed panel under counter height can be a good place for controls and outlets. You can even hide them behind a tilt-down panel. A child-friendly kitchen should also include a well-lit place to sit and work, within sight of the main area of the kitchen. This space for homework or arts and crafts should include connections for the laptop and tablet chargers and storagefor supplies within easy reach. Depending on the age of the child, the "kid zone" can also be a school lunch station, so storage for the necessary paraphernalia makes sense. Just like the rest of the kitchen, waste and recycling should be easily accessible and the dishwasher nearby. An obvious necessity for young cooks is a lower counter height. Kids need a work surface that’s around six inches lower than the standard kitchen counter height of 36 inches. If this seems too high, remember that a toddlers’ reach is higher that you may think and a stool can always help with any discrepancy. A lowered counter will still be useful long after your kids have grown and left the nest. The ergonomic advantages give your back a break when kneading bread or rolling pastry dough. The lower counter is also handy for tall, top-loading appliances like blenders and toasters. This lowered counter can easily be incorporated into an island and serve as a comfortable place to sit and eat. When it serves dual purpose, it's good for it to be least 48 inches wide and to have a depth of 26 inches. This gives a feeling of sitting at a table rather than perching at a shelf. If working the low counter into your plan isn’t feasible, installing a pull-out work surface in a lower drawer won’t break up the standard work surface. The drawer base can be designed in such a way that it can moved up a drawer as the child grows in height. A secure step stool (with a safety rail) can remove the inclination to crawl up on the counter. Our designers, when considering kitchens with kids in mind, advise storing everything you don’t want your children to use high up and store everything you want them to use lower down. A practical way to separate the two is a floor-to-ceiling, 12-inch-deep bank of cabinets. As the kids get older, out of reach items can be moved into the lower cabinets making it easy for them to help with daily chores like unloading the dishwasher and setting the table. Dishes and glassware can be kept in the lower cabinets, along with the cookware that the children use. Drawers containing utensils and silverware can be moved to a lower position so that the kids have easier access. Oftentimes, the layout and elevations within the kitchen itself can also discourage use of selected areas. If just saying "no" isn't enough, then a simple solution for cabinets containing those things that need to be off-limits is to add a cabinet lock. When thinking about cooking with your kids, go for engineered stone, such as Silestone or Cesearstone. They are virtually impossible to scratch or stain and easy to keep clean. “Easy to clean” is an important concern because after all, making a mess is part of the fun and kids sure can be messy in the kitchen. Choose a rounded edge for your countertops. Even if it doesn’t prevent any actual injuries, it will be kinder on your nerves every time children come running (flying?) through the new kitchen. For cabinetry that fits the bill, finish is more crucial than style or material. Lighter cabinet colors show dirt and abuse easier but reflect natural light better making the most of the space. Darker stained wood conceals scuffs, dents and bruises, making it more forgiving. Soft-close doors and drawers come standard on most custom cabinets these days and help prevent slammed fingers. For our clients, hardwood flooring is the most popular flooring choice. However, linoleum is recommended as child-friendly flooring because it is shock absorbent and easy to clean, plus dropped items are less likely to break. If you have a softer, more shock absorbent surface, standing at the stove stirring a risotto will be easier on you. Try this with tile flooring and you may find your legs beginning to ache before too long. When you’re picking appliances, choose the ones that offer features of specific benefit to children such as kid-friendly induction cooktops. The surface of an induction cooktop doesn’t get hot, only the pot gets hot (when in contact with the cooking surface) and the risk of a burn is eliminated as soon as the hot pan or pot is removed. Is a refrigerator with a water and ice dispenser child-friendly or a hostile feature? It’s open to debate but you’ll get more mileage out of a side-by-side fridge or a fridge with a dedicated snack space, easy for kids to access. While planning kitchen accessibility for young cooks, it’s important to remember that restricting access to things not intended for the child’s use is essential. Many modern appliances such as ovens, cooktops and dishwashers, are made with a control lockout feature. Prevent accidental use of the garbage disposal by installing a batch feed disposer or a continuous feed model with a clearly marked control, out of the reach of small children. If the cooking area has generous clearances, the risk of natural curiosity leading to injuries or burns is reduced. 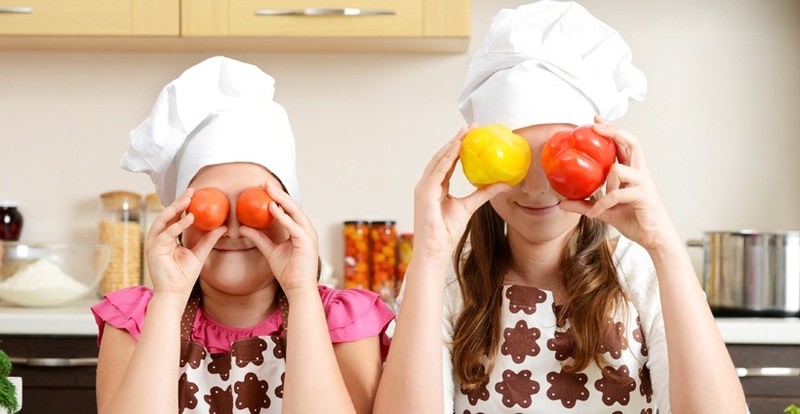 Encouraging your young cook is both better and safer when you have planned to have them in the kitchen from the start. Assign one drawer for healthy snacks and make rules about their availability i.e. choose one for an afternoon snack, or they’re free anytime. For a play drawer, put a bunch of plastic-ware into a bottom drawer and allow the children to play with anything in there while you’re cooking. A fruit bowl stocked with washed fruit in the kitchen will make fresh fruit an anytime snack. Attaching a magnetic board inside a cabinet door to hold a calendar, appointment cards, and those special pieces of artwork. Installing lowered hooks at kid height so your kids can reach hand towels and help with cleanup. There are many lessons for kids to learn when the family cooks together. As they crack the eggs, whisk, read, and talk about rceipes, children learn physical, mental, and social skills. And they’ll be watching Mom and Dad demonstrating key components of adult capability in action. Bon appetit!